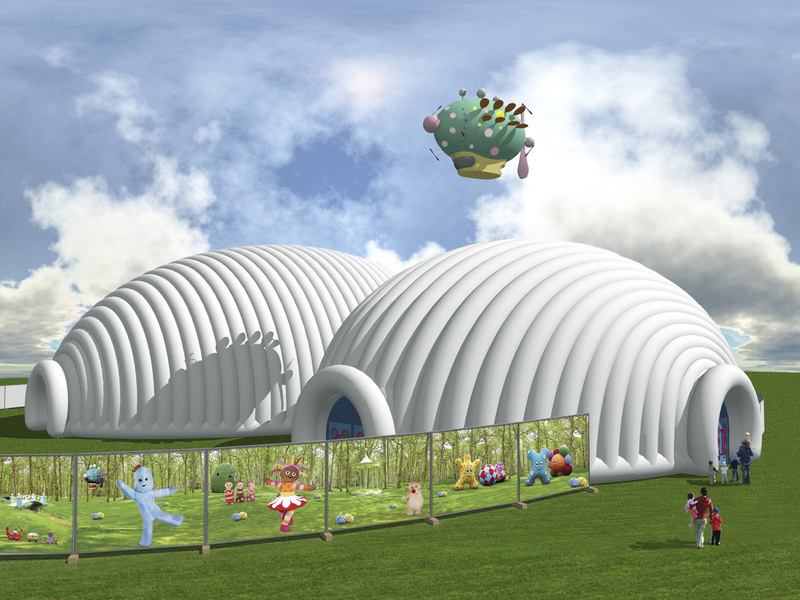 The In The Night Garden Live showdome is a purpose-built inflatable theatre, but this doesn’t mean it will blow away in the wind! It is entirely protected from the elements and is in fact a venue specifically developed with children in mind which makes it a step ahead of traditional theatres. It’s not the fault of those older theatres, but they have to cater for a wide range of audiences and so can’t focus specifically on children. The showdome only hosts In The Night Garden. It knows that pre-schoolers will always be in the audience, so there are plenty of loos, a buggy park, a microwave for heating up baby food and loads of baby changing facilities. It looks exciting as you arrive. I thought it looked like a giant white maggot but my husband was kinder as he thought it resembled meringue nests. As you walk in there are projections on the ceiling as the Pinky Ponk flies by and you do really feel like you’re going INTO the Night Garden. Once in the arena you don’t feel like you are sitting in something inflatable and the producers assured me that it cannot deflate while you are in there if somebody outside decides to get mischievous with a pin! It is all carefully monitored by computers, which includes the temperature. The “seats” are rows of steps which are tiered perfectly so that if an excitable toddler wants to stand up they can still see, and there’s also lots of room between the rows for children to move about if they need to. All in all, having a venue like this makes a trip to see the show just that little bit more exciting for the little ones – and the adults too!